A new “Quick Comments” column can be added to your Rollup layout. Quick Comments allow the user to supplement a record’s Rollup Stage with brief notes. These notes also appear when viewing the ‘Rollups’ area of the individual record. The number of clicks required to add a record to a list has been reduced, and even more so when adding a record to multiple lists at the same time. A ‘Filter’ icon has been added to the top of the Rollup Stage column header. Clicking it allows the user to temporarily filter their view of the list to only the selected Stages. Rollup Stage is now available as a primary or secondary Default Sort option when configuring your Rollup layout. The ‘Global Rollup Stages’ released in our October 2018 update can now be made mandatory for all newly created lists. If the checkbox is disabled, users can choose whether to use the Global Stages or their own individual ones when creating new lists. The use of the terms “Stage”, “Status” and “Description” on Rollups has been updated for consistency across screens. Rollup Lists are one of PCRecruiter’s most versatile features, allowing you to group and sort names, jobs, and organizations for a variety of purposes. This week’s update includes a set of improvements to Rollups that make them an even more convenient way to manage your contacts and positions. The new update uses fewer steps for adding records to a list, and makes it faster to add the same record to more than one list. You’ll open up the ‘Add to Rollup’ window, and then simply click on the lists you want to add the record to. You’ll see the record count for that list go up, and a colored progress bar to keep track of which lists you’ve already put the record on. We’ve also made some changes to the lists themselves. A new ‘filter’ icon appears at the top of the Rollup Stage column. In the popup, any Stages in use on this list will be highlighted, along with a count showing the number of records at that Stage on this list. Checking off one or more of the Stages and clicking ‘Done’ will filter your view to only the records matching your selected Stages. The filter icon changes color to indicate that a filter is active, and the filter remains active until you reload the list or remove the filter checkmarks. You can also set your Rollup configuration to use the Stage column as the default primary or secondary sort order, so that your lists sort by Stage automatically when you open them. The other new feature on the Rollup screen is a ‘Quick Comments’ column that can be added to your layout. 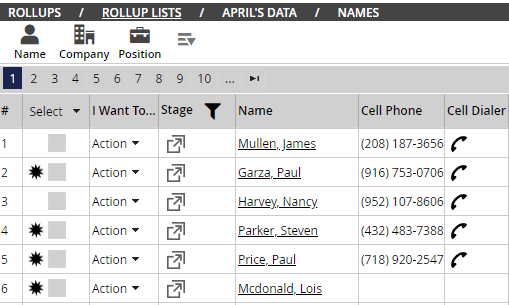 This column allows you to add a brief note to the Rollup List itself for each of the records on it, supplementing your Stages. For example, if you’re using the Rollup for a calling list, you might change the Stage to ‘Attempted’ and then include in the comments box that it’s your second attempt, or that the line was busy, and so on. These same comments are visible and editable from the Rollups panel of the record, so you can adjust or review the comments for all of that record’s various Rollups in a single location. Lastly, we introduced a new Global Rollup Stages feature last October, allowing admin-level users to define Rollup Stage icons, activities, and automation plans that could be applied to all users in the database, overriding any per-user Stage setups. This new version includes a setting which forces these Global Stages to be applied to all new Rollups. With the box unchecked, the individual user can select whether to use the Global Stages or to continue using their own personal Stage configurations on a list-by-list basis. Tell us what you’d like to see added to Rollups by logging into the Ideas and Requests forum at help.pcrecruiter.com. Post your ideas, or vote and comment on the ideas that would be helpful to you. Keep up to date on PCRecruiter by following us on Twitter and Facebook, joining our LinkedIn Users Group, and watching for the banner notifications inside of PCR and on your login screen. What would be nice is if the phone numbers on the Roll up could be active like the numbers on the record. So with RingCentral, I could click the number on the roll up screen and dial out or text without having to open the record. You can do that by adding the ‘Dialer’ column(s) to your layout. The phone numbers themselves cannot be clicked directly because it would interfere with our ability to record activity about the call, and also because clicking a row in the Rollup always loads the record. However, adding a Dialer creates a click-to-call icon that does what you’re describing. I would like to be able to apply filters to rollup list. For example, when using a rollup list for calls, I would like to be able to filter candidates with cell phone numbers. It is important to me the names remain part of a larger list while being able to filter specifically those with numbers. You can use the magnifying glass icon in the upper right corner of the list to look for only people with cell numbers. If you need help with the search, contact support@mainsequence.net for details. I understand you can differentiate stage set up presently by record type. I would like to be able to access multiple sets of stage icons that are customizable for different uses for within one record type. I.e. multiple stage configurations for name record rollups. By allowing for multiple sets of customisable stages to be toggled between in a single record type (e.g. name record), this would allow for better uses of the roll-up functions versatility. E.g. A name record roll up list that is for candidate contacts, and a name record roll up that is for lead contacts would benefit from different stage icons that can be linked to unique automations. Hi Sarah – That sounds very much like something that our Global Rollup Stages feature can do. Check out https://learning.pcrecruiter.net/global-rollup-stages/ and contact support@mainsequence.net if you need help with it.